"This was interesting and ultimately pretty unsettling with me because we are taught from a young age trees are pretty much ancient beings and live just about forever. What is going to happen if the lifespan of a human starts to surpass the life expectancy of a tree?" --Natasha H.
"Something that stood out to me was that the budget for this issue is still the same as it was 10 years ago. This made me upset because it is obviously an important issue and not only does it not get the attention that it deserves, it doesn't get the funds either." 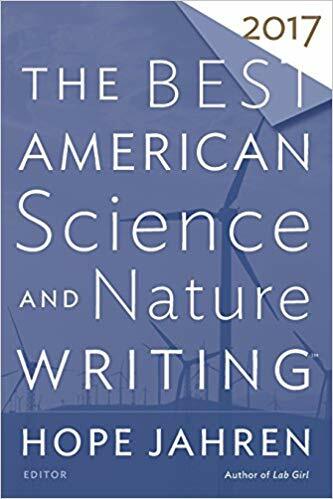 Dayejah C.
"I particularly made comparisons between the way in which we currently label food as 'organic' and the law on page 132, that said '...to leave park scenery and wildlife 'unimpaired for the enjoyment...' However, the author noted that the law did not define 'unimpaired.' Therefore, there was constant battle over the land because developers wanted to create new pieces for Assateague. This is an important point because it is not about the climate change and the science, but about law reform. People abuse the wording of laws and will try to use the unexplained and ambiguous definitions for their own benefit, just like in slapping the word organic on food that may not be 'organic.'" --Joshua J. What I appreciated about this article is that the author wasn't afraid to speak candidly, "... but the trouble with climate change is many of its effects are hard to predict... it's not clear whether total precipitation will increase or decrease, or whether the changes will be gradual or abrupt"(136). This seems to a fresh perspective compared to others who are completely biased towards one view or the other. I paid special attention to the wildlife surveys that were taken in 2003 at Yosemite National Park when Berkeley researchers noticed "ranges of several small mammals had shifted significantly uphill...two other once-common mammals, a chipmunk and a wood rat, were almost extinct in the park" (134). Although I've never been to a national park, I can relate to going to the zoo to see specific animals. I'm sure many people do the same regarding national parks. Therefore, to hear one of your favorite animals, for example, are no longer present at a specific location is nearly heartbreaking. However, climate is expected to change. Plants and wildlife are forced to adapt, so we have to adapt as well. As mentioned in the article, future generations will still be able to enjoy the park, but it may not be in the same way past generations have. Something that stood out to me in this article is the fact that even though the Leopold Report proved hugely influential and reintroduced species in the park that had vanished (133), their focus was not on the betterment of th Park nature wise, but recreating the static scenes of the park. This basically represents America as a whole I feel like. We do not care so much about how we should go about preserving wildlife, but how wild life looks. Unless millions of treees are visibly dying infront of our eyes, we will not put in the effort. And that will only prove detrimental to us. What stood out to me about this article is that park services officials were encouraged to not "go into it if you can help it(134)." This is just crazy to me because their job is to preserve these parks and they can't do that if they aren't alerting the public to the major issues. What stood out to me the most were the lengths park rangers, biologists, and scienctist were willing to go to save the endangered animals. They carried "...captured bull trout and carried them in backpacks to a higher,cooler lake..." (137). They did this to save the trout from climate change and other invasive trout. On page 134, Michelle Nijhuis stated, "The glaciers in Glacier National Park were shrinking...Shortly after the turn of the century, researchers in Glacier announced that by 2030 even the park's largest glaciers would likely disappear." This statement stood out the most because it showed that the effects of climate change are going to drastically affect us sooner than we thought. I believe when people think about the year 2030, they believe that's really far into the future but this is very soon as most will reach this decade within their life time. The decrease in the amount of glaciers will only cause the sea levels to rise more and create even harsher consequences environmentally. Climate change has been a discussion in my educational experience for as long as I can remember, but as I become older and read more articles such as this I am able to see the long lasting impacts that have occurred. The human-caused change that stood out to me was on page 132 where it states "storms destroyed the parking lots six times in 10 years. The visitor center was damaged 3 times." What stood out to me more though was the incentives of the park to accept and acknowledge the changes in order to find ways to adjust. I found this interesting because a nice portion of the world still likes to pretend that climate change does not exist. We always hear about climate change and how it affects wildlife, but never in a straightforward way. The author of this passage made it clear that something must be done. One thing that stood out for me was the fact that many of the workers who strive to preserve the wildlife have to try to find new environments for creatures like the blue butterfly or plant life like the sequoia trees because conditions are becoming more and more unbearable. Who’s to say that they will ever find a suitable environment for those suffering beauties? What stood out to me in this article was the Park Service's avoidance in talking about climate change due to it being political (134). If climate change is causing issues in national parks, wouldn't one want to tell others so they could figure out solutions to slow the problem down or possibly stop it? Even if it is political, it is very much affecting everyone's lives. "People had long came to national parks to experience the eternal-to get a glimpse, however deceptive, of nature in its stable, "unimpaired" state". The inconvenient truth of climate change made it more difficult for the Park Service to offer that illusion. But no one knew what the national parks should offer instead"(134). Although talking about the causes of climate change were not approved of, after reading I saw an opportunity to educate visitors about the impact of climate change caused by humans. The article made a lot of interesting points on climate change, but one that I thought was most interesting was the point about how some wildlife preservers have to find different areas for certain species to live because their environments are becoming more toxic. It interested me because it's hard to find a habitat for something that has evolved in a way that accommodates for a certain environment. The point that stood out to me was the idea that climate change is "political". I think its ridiculous for a problem to be declared political and that excuse is used as a scapegoat for not discussing it. I think that climate change is a pathological social problems that our community needs to address without the limitations of a political standpoint. Climate change is an issue that affects all of us, with that being said we all should have a say on what changes we can make to our society to combat climate change. Michelle Nijhuis said, “Like the Parker Service, visitors must learn to accept that their favorite park might change” (137). Society as whole doesn’t really enjoy or encourage change. Change scares people,and when people get scared they don’t completely think. I appreciate how there are still people out there realizing that in order to move forward and progress you have to be willing to change some things. You don’t know for sure what your going to like or how things are going to work out. You have to be willing to take that step and put yourself out there. You never know it may the greatest thing you’ve ever done. What really baffled me was when on page 134 they told the park rangers to no go into the park if they dont have to. What are they being paid for if they dont go in there how are they protecting the park that way. What stood out to me was the glaciers melting in Glacier National Park. Constant emission of CO2 into the atmosphere causes the global temperature to rise, giving way to higher sea levels than previous years. Hopefully, people will stop politicizing this issue and take actions to provide a better future for the next generation of people. "The glaciers in Glacier National Park were shrinking, wildfires in Sequoia were getting larger, and coastal parks were losing ground to rising seas." Glaciers are disappearing at a faster rate due to rising temperatures. Furthermore, human activities such as burning coal and cutting down tropical forests have contributed to higher temperatures. Scientists have noted changes within our planet for a while now. Global warming should not be politicized. It's an issue that humans have to address. If not addressed at all, there's an ominous future ahead. The part that really stood out to me was, "In their lowest-elevation study sites, below the sequoia zone, 16 percent of the trees have died this year, approximately tenfold the usual rate. 'It's about what you'd see after a low-grade wildfire,' says Stephenson" This stood out to me, because it really put the amount of harm humans are causing into perspective. "The current drought may be a preview of the future, but the trouble with climate change is that many of its effects are hard to predict." (136) This point stood out to me the most just because it gives a glimpse of possibly what kind of stress this causes the park service members. They are not exactly sure of what is going to happen therefore they must be prepared for a vast variety of scenarios. Having taken an environmental ethics class, I find the entire concept interesting. I understand the desperate attempt to save the animals humans have put in danger. Climate change is only happening this quickly and at a rate animals can't adapt to because of us. I agree that nature shouldn't be kept static, as their efforts are moving from, but it's also not controlled human intention. The things they are trying to save exist through natural selection. I appreciate individual passion, but this is more so an economics game than a political one. People's values aren't matching, and odds are people with "good values" don't see how their own negative aspects.People feeling sad about endangered animals more commonly just want them as living trophies, something pretty to look at when they feel like it. Not saying that's bad, it's just important to understand motives so that you can shape people to share yours. One of the human caused climate changes affecting the seashore that stood out the most was how much this was affecting the parks. It says on page 137, "visitors must learn to accept that their favorite park might change." I think this shows that these things are not something that might affect our grandchildren as people always say it but us, and how we live now. Throughout my education, I have always heard the recurring theme of climate change and its importance in this world. This change has huge impacts on our society and the way that we live. It is so important to understand this. A change prompted by humans that most caught my eye stated, "...storms destroyed the parking lots six times in 10 years. The visitor center was damaged 3 times." (132) This made me really think how necessary it is to not only acknowledge the changes of the climate but also to adjust to it, knowing how we as humans are changing it. What stood out to me the most was that they worked to try to find a way to make things easier after a storm. "Working with the park's architect, Ennis and his coworkers adapted the toilets, showers, and beach shelters so that they could be moved quickly, ahead of an approaching storm." (132) This stood out because they figured out that they could not change what was going to happen, but they can prepare themselves and learn how to adapt to the situations. These things are done so that there will still be a park for future generations, even if it's not the same park. I found it interesting when the text stated, "For a while the Park Service avoided talking about the subject. To acknowledge the reality of human-caused climate change was a political act, and the park service doesn't discuss politics with its visitors" (Nijhuis 134). This quote made me think about the impact that politics have on everything we do. The fact that even the rangers avoid talking about the causes of the change in climate just makes it worse. One thing that stood out to me the most was on page 134 when the author said "The pattern was clear; climate change had arrived in Yosemite too." This particular spot stood out to me because while I don't know much about National Parks and things like that, the name Yosemite is something that I've always heard about and I never thought that something could ruin the park. But with animals leaving because it's getting too hot it or how there are wild fires happening a lot seems like there are many problems we are facing with climate change that could impact the future of areas all around us. What stood out to me was the quote on page 134. Michelle Nijhuis stated, "The glaciers in Glacier National Park were shrinking...Shortly after the turn of the century, researchers in Glacier announced that by 2030 even the park's largest glaciers would likely disappear." This interested me the most because it really paints the picture that climate change is so drastic, an entire National Park could disappear. 2030 is not that far away, so it is a little frightening to think that giant glaciers could be all gone, causing sea levels to rise and leading to more and more environmental issues. It is unfortunate that a lot of our problems stem from political standpoints. Climent change has a big political standpoint. "The pattern was clear; climate change had arrived in Yosemite too" (134). National parks are very important not just for nature, but for humans too. Unfortunately, some people do not realize that. The current drought may be a preview of the future, but the trouble with climate change is that many of its effects are hard to predict."(136). I know that people contribute a lot to climate change. Although naturally the climate goes through warming and cooling periods, people have sped this up and made it much worse. This quote stood out to me because it shows that we are causing all this damage and we don't even really know what the consequence will be. Something that stood out to me was that the expense giving for this issue is still the same amount as it was years ago, prices for things have gone up and is continuing to go up as the years go on and for something as serious to not have enough funds to improve it how would they expect any improvement to occur. Erica K.
The fact that climate change is causing area extinction of certain mammals in Yosemite park shows just how important addressing climate change is. If staple foods like chicken or beef were going extinct, humans would react differently and behave more responsibly, but since they're wild animals in a park, we just dont care. That is alarming. What concerned me the most was the rate at which trees was dying and the long term effect of the wildfires. This can be best explained on pg. 136. It states, "16 percent of the trees have died this year, app...rate." Stephenson says that it's only about what you will see after the "low-grade wildfire." I think that is wrong is some ways because wild-fires can have a much more negative affect on the area that's being set on fire and surrounding areas. That's a concern because it can destroy things that are not intended to be destroyed. The descriptions to what exactly has been happening to various state parks over the course of the past 4 decades are what was alarming to me. "The glaciers in Glacier National Park were shrinking, wildfires in Sequoia were getting larger, and coastal parks are losing ground to rising seas(134)". The impact of climate change is clearly visible, but yet there are still those who try to mitigate the significance of climate change or deny it's existence altogether. I'm just curious as to what we're going to call Glacier National Park when there's no longer any glaciers... "National Park" or maybe "Glacierless National Park? I don't know, we'll see I guess. The thing that stood out the most to me was on pg.134 where they talk about melting glaciers and rising sea levels. These are both major factors in creating much stronger more intense hurricanes and tropic storms which will continue to cause more and more damage if we are not able to get a handle on climate control.